This situation is a little awkward but: I ate the Lay's light chips (the ones cooked with olestra) and [they] produced some rather unfortunate side effects the next morning, as you can imagine. I checked but there was no warning on the packaging. How come they don't warn about the side effects of Olestra? Welcome to nutrition politics! I'm getting ahead of myself, though. Let's begin with some general information. Olestra -- a calorie-free fat-substitute made by linking fatty acid chains to sucrose molecules -- was developed in 1996 by multinational consumer goods giant Proctor & Gamble. I am sure many of you remember the popularity of "WOW!" chips in the late 90s. Those were fat-free thanks to the inclusion of Olestra. At the time, two things stood out to people who read the nutrition label and ingredient list. First, vitamins A, D, E, and K were added into the product. A "healthier" potato chip? No. Since Olestra inhibits the absorption of these vitamins, it was decided to fortify such fat-free products with them. However, the statement following the ingredient list caught most people's attention: "Olestra may cause abdominal cramping and loose stools." Yum! Why is this? Olestra travels through our bodies completely undigested. In turn, even not-so-large quantities result in less than pleasurable side effects. Alas, time went on and the Food & Drug Administration received over 20,000 formal complaints from consumers. The overwhelming majority revolved around the consumption of Wow! chips and painful -- sometimes painfully embarrassing -- side effects. This made Olestra the food additive with the most complaints in the history of the FDA. Interestingly enough, Wow! 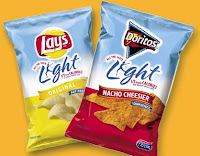 chips were soon replaced by "light" varieties of popular snacks. The perfect marketing trick, if you ask me -- offer a product with a tarnished reputation under a different name. Remember, this is Proctor & Gamble we are talking about here. A lot of money -- and corporate interest -- is at stake. I should also mention that Proctor & Gamble is known for its overly generous contributions to the Republican Party. This nugget of information will come in handy in a about two seconds. Fast-forward to October of 2003 when, magically, during a Republican presidency, the FDA announced that products containing Olestra no longer need to list warnings on their packages. Their reasoning? The reported gastrointestinal side effects were "mild and rare." In fact, one of their main arguments was that abdominal cramps and diarrhea are common, and Olestra was just getting a bad reputation. I don't think Olestra is worth all the trouble. If you are looking for a lower fat conventional potato chip, try Baked chips (I personally think Baked Lay's taste like salted cardboard, but the new Kettle Baked Chips are tasty), which contain 85% less fat than their regular relatives and absolutely no Olestra. What about swaps like the Western Alternative Bagel? In The News: A Soda Tax? Numbers Game: I Want My Junk TV!